Breanne Williams. Jason Jones called Karen Kerr just after midnight of the New Year to wish her luck on her incoming term as chairman of the board. The 2018 Chairman of the Board Jason Jones passed the Chamber’s gavel to the 2019 Chair Karen Kerr in a ceremony last week. The 2018 Chairman of the Board Jason Jones walked to the stage with a pep in his step as the room was flooded with the mellow notes of Counting Crows’ “Mr. Jones.” He thanked everyone in attendance and at the Chamber for having given him such a warm welcome and helping him accomplish his goals for the Chamber over the past year. Under his guidance and the hard work and leadership of the Chamber, staff members were able to take part in new networking events like Java & Jeans, which combines an early morning coffee and breakfast with crafting connections with local business leaders, and brought the desires and needs of local businesses to the floor in Tallahassee with the creation of the Government Advisory Committee. Jason Jones passed the gavel to the Chamber’s new chairman Karen Kerr. 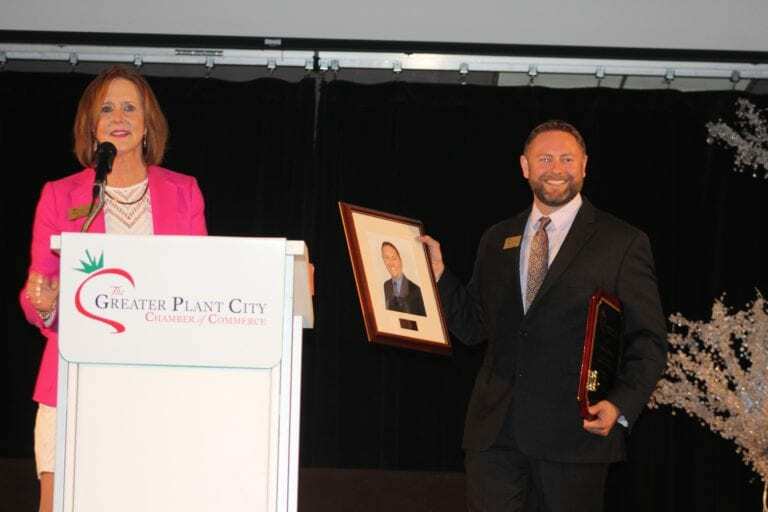 One of the greatest Chamber events created in his term was the Plant City Chamber Candidate Forum, which was held in August. More than 50 candidates in the 2018 election came to Plant City to meet their potential constituents and to share their platform and goals for office. The hall was packed as nothing of this size or nature had ever been available in Plant City before. Educating the public is a major focus for the Chamber and Jones said thanks to the success of the event he expects the Chamber to be able to continue to provide the service for years to come helping elections become that much more clear for local voters. Jones joked about being pseudo-kidnapped as a young entrepreneur in town many years ago and forced to join the Chamber before he would be returned home. He said it was one of the greatest decisions he ever made and his passion for connecting others led him to get involved on a variety of levels over the years. Networking events helped him grow his business into a success and he said one of the things he is most proud of during his time as chairman was to be able to help offer more networking opportunities for the public so regardless of work schedule or life demands everyone would have an opportunity that worked for them. Right before closing he thanked his wife for supporting him in this endeavor even though it often meant he would be away from home showing encouragement for whatever Chamber event he needed to be a part of. He joked that he wished he could say he would never run for anything or join another committee or board, but they “both knew that wouldn’t be true.” His love for Plant City pushes him to give as much of his time as he can to help it grow into the perfect place to live, work and play and he’s ready to continue the fight for its prosperity. With a smirk, Jones shared a tradition of all Chairmen making a special call on New Year’s Eve to the incoming chair immediately following the stroke of midnight. While jesting he may have woken Karen Kerr up he said it was an honor being able to wrap up his year at the helm and let her know how excited he was to see where she would steer the Chamber over the course of the next year. “For the record, I was not asleep,” Kerr said with a laugh as she approached the podium to share her vision for the upcoming year. Kerr said she is excited about the momentum the community is feeling in regards to its Chamber and all the new and revitalized services it is providing. The Chamber is at a place where it is full of board members that are all ready and willing to work together for a common goal, according to Kerr. The future is bright as they continue to build a strong connection with the community and local businesses and help Plant City become a destination. Kerr highlighted three topics as her main areas of focus for the upcoming year. She wants to develop a strategic plan for the Chamber, one that it can refer back to for years to come as it continues to grow and evolve. She also wants to continue to grow and develop new memberships. Her final focus is to continue to pour into the Governmental Advisory Committee to make the needs of Plant City a viable topic on the floor in Tallahassee. While Jones used his jovial attitude to get a lot of balls rolling, Kerr will use her vast experience as the South Florida Baptist Hospital president to help perfect the plans currently in place and sharpen the dull edges surrounding projects with the organization. The Chamber is on the right path, now Kerr is here to optimize its efficiency. Part of that process lies in the opportunities available for members. The Chamber should have an environment that is welcoming to all and beneficial for whomever decides to join its family. There is room for growth in that department, Kerr said, and soon she hopes to further the Chamber’s reach even more throughout Plant City. The Government Advisory Committee will also receive the full support of Kerr. The next steps she said are to return to Tallahassee for the legislative session and to help set legislative priorities that resonate with the businesses and residents in Plant City. It’s also time to further education opportunities with members in regards to politics and what the legislature can actually do in each of their lives. She wants to make a focus on the agriculture aspect of Plant City. One of the Chamber’s first big ag tours is next month and she said she is excited to see more education and partnerships blossom over the next year.